Of course, there are always issues .... Listed below in more detail are the 'major' problems we ran into and the things to take into consideration and keep in mind before, while and/or after swaping the new 2000+ Mitsubishi 3.5L (6G74) engine into a 3.0L (6G72) Mitsubishi Montero Sport 5-speed (V5MT1) vehicle. Note: This was was done on a heavily modified 1997 Mitsubishi Montero Sport LS 5-speed with a solid axle swap (SAS). Some or all of the information contained herein may be incorrect or irrelevant if doing such a swap on a stock 1997-1999 Montero Sport. Obvious issues that would affect such a swap will be noted but will not represent a comprehensive list. The motor mounts (isolators) and motor mount to engine brackets are completely different between the 1997-1999 3.0L and 2000+ 3.5L. The 3.0L plate won't bolt to the 3.5L block without a lot of modification and even after that the brackets are in the wrong location. Rebuilding the brackets to use the 3.5L engine block mount plate and the 3.0L bracket stand off piece was relatively easy and allows the use of the 1997-1999 3.0L motor mounts. A lot less work and hassle. Luckily, the new 3.5L came with the motor mount brackets and the 3.0L pieces were still in good shape so we had all the necessary parts. # 2 The 3.0L oil pan and 3.5L oil pan are completely different designs. Both 'oil pans' come in two pieces. An aluminum upper section and a steel lower section; the parts are not interchangeable. Thankfully, the overall height is almost the same measured from the block surface to the bottom of the steel section of the pan. The issue with the 3.5L pan, however, lies in the increased length of the lower, steel section. The front extends several inches beyond the front of the block and several inches further towards the rear of the block. The front extension should never be an issue. There is plenty of room between it and the sub-frame below the radiator and the fan shroud sits a considerable distance above. The extension of the rear of the oil pan potentially poses a much bigger issue. 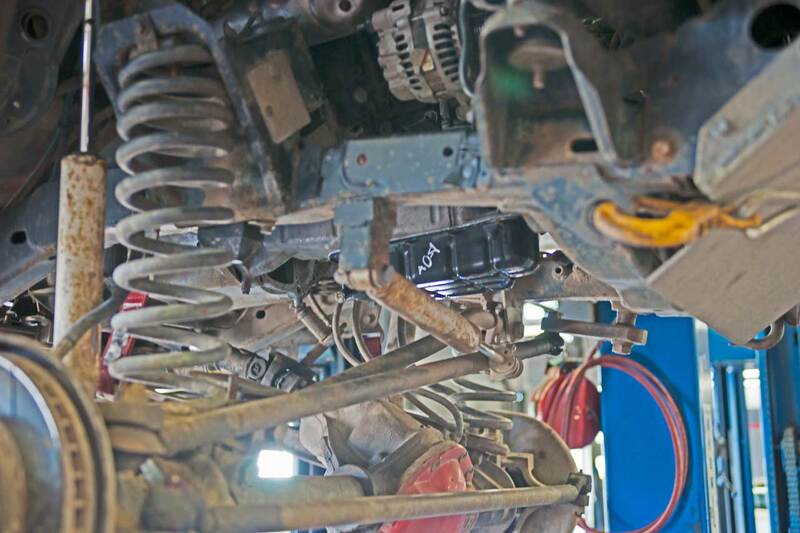 The 3.5L engine, transmission and transfer case assembly in a 2000-2005 Montero Sport is positioned closer to the front of the vehicle. This isn't apparent unless you have a stock 2000+ 3.5L Montero Sport sitting next to the conversion vehicle from which to make comparisons, but explains how Mitsubishi could get the 3.5L oil pan to clear the sub-frame while still allowing the hood to close without hitting the oil fill cap. Since this conversion is being done on a vehicle using the Mitsubishi V5MT1 manual transmission it's not pratical to copy Mitsubishi and move the entire engine, transmission and transfer case assembly forward. Besides the obvious problems involved in modifying the shifters this is almost certin to result in difficulties reconnecting the factory wiring looms and throttle cable. stabilizer and the track bar move up - towards the area now occupied by the 3.5L oil pan. The accompanying pictures illistrate the problem. They were taken with the axle at full droop but it's easy to see how much of an issue this may be. A (necessary) partial solution is to mount the engine as high as possible in the engine bay. Keeping in mind that the hood needs to be able to close, the coolant pipes and hoses at the rear of the block (especially if the vehicle is equiped with the rear seat heater) must clear the firewall, the cruise control box on the firewall needs clearance, the transmission, bell housing and transfer case assembly must clear the tunnel and one still needs to be able to access bolts without droping the entire engine assembly. Another part of the solution may include clearancing the oil pan to allow room for the track bar to move when the suspension compresses. This should be a relatively straightforward modification. 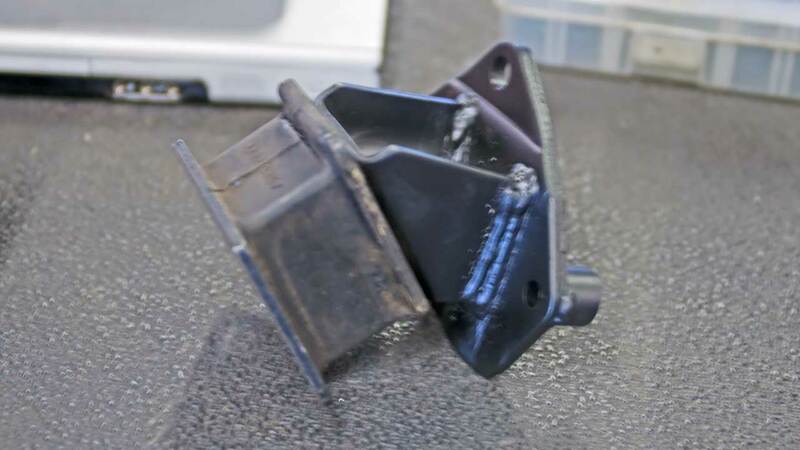 Nothing protrudes into the lower section of the oil pan except the oil pump pickup (strainer). 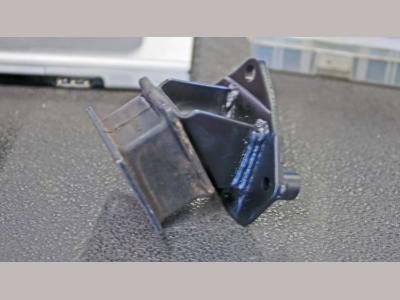 Depending on how much of the rear of the oil pan needs to be removed it may be necessary to either modify the 3.5L oil pump pickup to move the screen closer to the front of the pan or use the shorter 3.0L oil pump pickup. Opening up room for the drag link may pose a more serious problem since it runs directly across the sump area that contains the oil pickup. A better option might be a custom lower half or complete pan similar to Moroso's oil pan for the Mitsubishi 4-cylinder or Moroso's Mitsubishi EVO 10 oil pan. 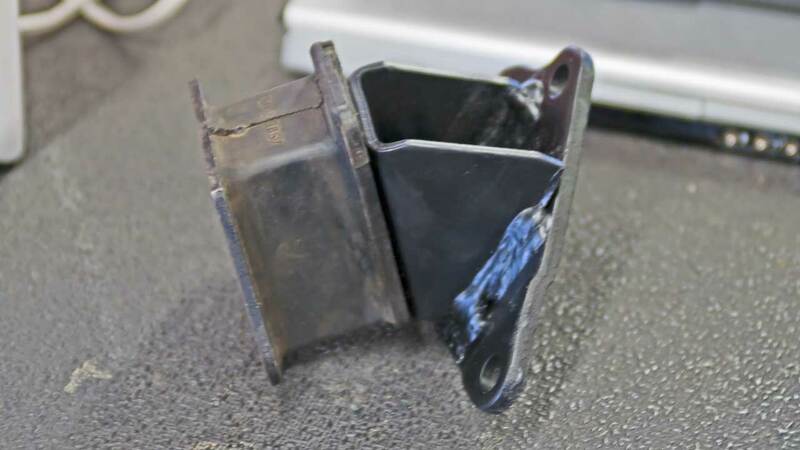 These two solutions would be prefered over the maybe obvious solution of relocating the frame end of the track bar down or making an S bend in the track bar to clear the bottom of the pan. Neither of these solutions are a good idea in this case. In order to maintain proper steering geometry and not introduce bump-steer the track bar needs to be parallel to the drag link - which it now is. Putting bends in track bars is generally considered to be a 'Bad Thing'. Any bend in the bar reduces it's strength and this is absolutely NOT the place you want to introduce a point of failure. # 3 Ths exhaust is relatively minor. It's easy enough to modify the factory 3.0L Y and down pipe to accomodate the slighly wider block so that everything connects in the stock location. 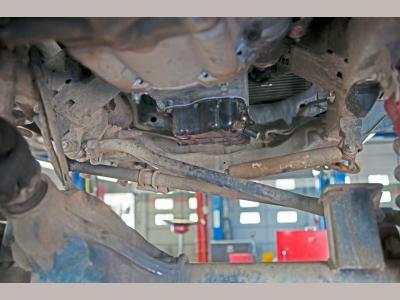 If there are plans to install a 3-link or 4-link front suspension in the future, now is a good time to start planning ahead. Making the necessary changes in the exhaust now to clear the upper link(s) will save time and frustration in the future. # 4 The primary difference between the 3.0L and 3.5L exhaust is the multiple catalytic converters (CAT) and extra oxygen sensors. The 2000+ 3.5L vehicles use two 'pre CATs' - one located in the down pipe and the other in the Y pipe - and two O2 sensors located (one each) before the two CATs. The 1997-1999 Federal 3.0L vehicles use two O2 sensors and one CAT - one sensor located at the front of the CAT and one located at the rear. Most locations where vehicles are subject to emissions testing have both a visual test (which includes confirming CEL status and OBD) and an exhaust gas test. The regulations are usually such that if an engine is replaced, the vehicle is subject to the emissions regulations applying to the year the engine was manufactured NOT the year of the vehicle into which the engine is installed. So, if a 2004 3.5L engine is installed in a 1997 Montero Sport, it must comply with the emissions regulations that would apply to a 2004. That can be problamatic. Without an extreme amount of effort, it is virtually impossible to make a 2000+ 3.5L swap into a 1997-1999 strictly emissions legal in some states. Either it will fail the visual test, exhaust gas test or both. The visual test is the easiest to pass but still depends on whether it's tested based on the vehicle year or engine year. Cosmetically the 3.0L and 3.5L are virtually identical and would require an expert in the two engines to tell the difference. Mechanically, nothing changes that affects any emissions related devices already on the vehicle. Since the computer, wiring and sensors from the 3.0L are reused there shouldn't be any issues with the OBD and CEL check. However, if the inspection is based on the engine year, lacking the two pre-CATs is a major no-no and would be apparent to someone knowledgeable when doing the exhaust inspection. The exhaust gas test is actually a group of individual tests that check the emissions emited by a vehicle at specific stages of a trip - cold start, cold idle, hot idle, stop and go, highway, etc. State regulations specify what pieces if not all of the test is required and those will dictate whether the engine needs the pre-CATs installed to pass. Keep in mind that in most cases whether the vehicle passes the entire exhaust test without the pre-CATs is irrelevant - if they are required by law, then they are required. Unfortunately, it isn't as simple as just installing the pre-CATs. On 1997-1999 Federal vehicles the O2 sensor in front of the CAT supplies the information used by the ECU for fuel metering. 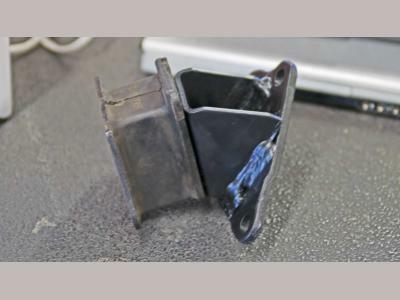 This O2 sensor MUST be present in the exhaust system before the catalytic converter(s) otherwise incorrect fuel metering would result in severe engine damage. It also isn't as simple as moving the existing O2 sensor to the Y-pipe or down pipe in front of a pre-CAT. While this might work well enough to make the vehicle driveable, the ECU would be basing it's adjustments for all six cylinders off of three cylinders. Mitsubishi used batch injection (all six injectors fire in a 'batch' every time a spark plug is fired) and a single O2 sensor on the 1997-1999 3.0L engines. So, fuel metering is based on an 'average' of all six cylinders and it isn't unreasonable to expect one side of the engine to differ from the other enough to cause a condition that the ECU can not compensate for because it's unaware that the condition exists. A good example is the variance between the amount of fuel delivered by each fuel injector on an engine. In a duty cycle a fuel injector is supposed to deliver a specific amount of fuel +/- n%. Racers pick and choose and test dozens of injectors to put together a set where the difference between injectors in a set is as small as possible so that (as close as it's possible) the same amount of fuel is delivered to each cylinder. On a stock vehicle the percentage of difference between six injectors can be relatively large and generally it gets worse over time. One or more injectors on the 'un-monitored' bank can deliver either too much or too little fuel to their respective cylinders causing a lean or rich condition. 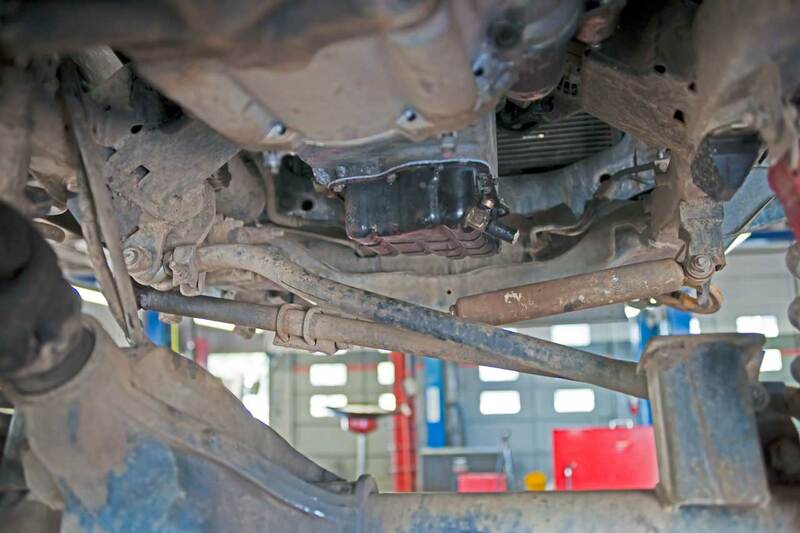 A lean condition can cause pre-detonation and catastrophic engine failure while an overly rich condition can cause cylinder wash and premature cylinder failure, premature catalytic converter failure, erroneous OBD errors and abnormally high vehicle emissions. 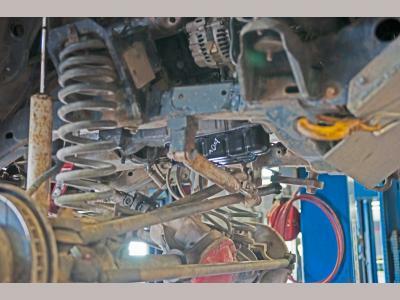 Without rewiring the entire vehicle the only pratical way to incorporate the extra two O2 sensors and catalytic converters from the 2000+ engine is to use what is called a piggy-back ECU or ECU replacement like MegaSquirt that allows a user to incorporate the two additional O2 sensors into the system. A solution like this (properly tuned) should run even cleaner and yield better gas mileage than stock. The drawback is that most (if not all) of these systems are not CARB certified and are therefore classified as for 'off road use only' and may not be used on public roads. Another thing to keep in mind is that factory ECUs can contain general information including but not limited to the make and model of the vehicle, engine displacement and VIN and that information may be accessed through the OBD plug with the proper equipment - which you can be sure your local emissions testing station has. So, you need to be aware that no matter how well you physically conceal an aftermarket ECU it is impossible to do so electronically. # 5 There are some things that never occur to you until after you're 99.9% done and then it's "Huh? How'd that happen???" The 3.5L engine is heavier than the 3.0L engine. How much is unknown, but it is enough to drop the front of my SAS'd Montero Sport about 1-1.25" while using Ford F150 progressive coil springs with 2.5" of lift. This was suprise since the Ford springs aren't exactly soft. So, just keep in mind that the 3.5L engine may require a change in front coil or leaf spring rates and/or valving if using coil-over shocks. # 6If the donor engine came with a complete top end and the fuel system in the vehicle the engine is being transplanted into is up to spec, there is very little if anything that requires attention. The 3.0L SOHC Engine Control Unit (ECU) appears to work fine with the 3.5L SOHC engine. It should be noted however, that in May of 1997 Mitsubishi changed the ECU for the 1997 Montero Sport LS 5-speed. Mitsubishi isn't forcoming with what changed but personal experience with both ECU versions makes it clear that SOMETHING in the programming was changed. There is a distinct increase in low end torque and a decrease in high end horsepower with the new generation ECU. Typically, effects such as that experienced are traceable directly to fuel and timing curve changes, which should be better suited to a longer stroke engine such as the 3.5L. Retain the 3.5L fuel injectors. Even though the 3.0L and 3.5L injectors are interchangeable physically, do NOT attempt to use the 3.0L injectors on the 3.5L engine. The existing 3.0L SOHC fuel pump is sufficient but ONLY when used with the 3.5L SOHC engine. Use of a 3.5L DOHC engine requires a DOHC fuel pump. Mitsubishi issued a Technical Service Bulletin (TSB) some time ago for the 3.0L Mitsubishi Montero Sport LS changing the recommended minimum fuel rating from mid-grade unleaded (minimum octane rating of 87) to premium unleaded (minimum octane rating of 90). Failure to use premium grade fuel could cause detonation possibly resulting in engine damage and failure. The 1997-1999 Montero Sport does not employ engine 'knock' sensors that allow the ECU to detect detonation and automatically retard the ignition timing. The use of premium grade fuel is still recommended. Update: After spending a week experimenting with fuel grades, it may not be necessary to run Premium grade fuel. Although the Mitsubishi owners manual recommends Premium grade fuel for the older 3.0L engines due to their compression ratio, the Montero Sport SOHC 3.5L compression ratio is one point lower. After two and a half tanks of mid-grade (89 octane) fuel there doesn't seem to be any issue with detonation either on the highway or off road. Careful attention should be paid when experimenting with fuel grades. As they say, 'your mileage may vary'.